"I like to optimize every carb or calorie I eat to be healthy as well as delicious. 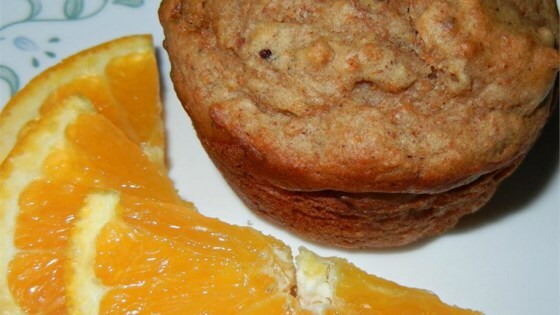 This recipe combines bran and yogurt to make a really scrumptious muffin! These can also be made with fruit yogurt by leaving out the cinnamon and nutmeg and adding 1/2 cup fresh berries." Preheat an oven to 400 degrees F (200 degrees C). Prepare 12 muffin tins with cooking spray. Whisk the egg, oil, yogurt, and half-and-half together in a bowl until combined; stir the bran cereal and walnuts into the mixture. Mix the whole wheat flour, all-purpose flour, brown sugar substitute, baking soda, salt, cinnamon, and nutmeg together in a separate bowl; add the flour mixture to the egg mixture and stir just until moistened. It's okay to add a little more half-and-half if the batter is too stiff. Fill each muffin cup about 3/4 full. Bake in the preheated oven until a toothpick inserted into the center comes out clean, about 18 minutes. Remove immediately to rack to cool. This delicious muffin creates a perfect dome and is light and moist. This recipe is delicious! I added raisins to mine. Best bran muffins I've ever had!